This is another break-through post by MPT - My PC Tips dot com, in this article you will easily learn that how can you start typing URDU using Adobe Photoshop. Because by default you can able to type URDU in Photoshop but all URDU alphabets will be separate without joining each others. In my last post I have revealed the steps for enabling URDU Language in PC with Phonetic Keyboard which will work for entire computer but not for Photoshop, at that moment you will only be able to type Urdu in your PC while using Notepad, Wordpad, MS Office i.e MS Word, MS Excel, MS PowerPoint etc and also for web surfing by typing Urdu in web browser but Photoshop didn't allow it until making some changes in Photoshop settings. So you can call this article as connected post of previous one because without last one it is not worth, because you have to first perform last post steps to enable Urdu Keyboard so that you can proceed with this one. 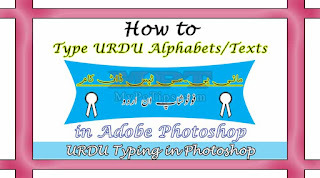 In this post, you don't need to be expert for understanding any point because there is a small change which will let you to type Urdu in Photoshop easily and either English at the same type by switching language so don't worry about it because English keyboard will be still primary one while at the other hand Urdu will become secondary language. First follow steps shown in post "Enable Urdu Keyboard for PC". Now Launch or Open "ADOBE PHOTOSHOP". Go to "EDIT>>PREFERENCES>>TYPE" from Top Menu Bar. In Preferences Window, choose radio button as "MIDDLE EASTERN AND SOUTH ASIAN" from Choose Text Engine Options. Click on "OK" to Apply Changes. Now go to and Select "TYPE>>LANGUAGE OPTIONS>>EAST ASIAN FEATURES" from Top Menu Bar. You're Done, now you are able to Type Urdu Fonts properly in Photoshop. TIP: Open On-Screen Keyboard for Urdu English Key Combinations.